Heat oven to 350°F. In large bowl, break up cookie dough. Stir or knead in flour, apple and apple pie spice until well blended. Drop by rounded tablespoonfuls onto ungreased cookie sheets. Bake 14 to 16 minutes or until edges are golden brown. Cool 1 minute; remove from cookie sheets to cooling racks. Cool completely, about 20 minutes. Meanwhile, in small microwavable bowl, microwave caramels and half-and-half uncovered on High 30 to 60 seconds, stirring once, until caramels are melted. 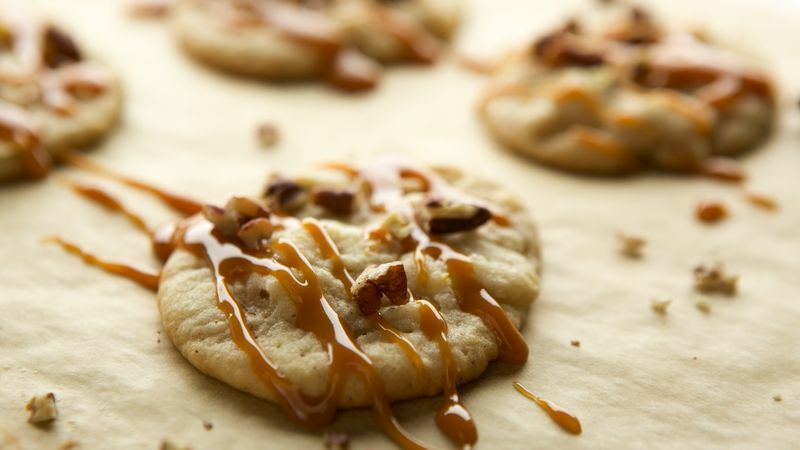 Drizzle over tops of cookies; sprinkle with pecans. Store covered in refrigerator.